Our Last Stand is Now Available on Amazon! 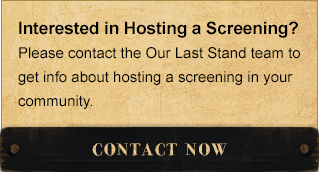 Our Last Stand is now available for rent or purchase on Amazon. Please spread the word! Click here to purchase or rent it today! Our Last Stand will Screen on Al Hurra TV/Middle East Broadcasting Network until 2020. Check local listings for details.